Join this wonderful friendship between Our BBS heroine and the 7th Princess of Heart. This is a bond not even Xehanort can break. What makes these two good friends in the Future of Kingdom Hearts? I request joinage. I like this friendship pairing. Welcome Realm Walker! You'll bere added soon. Awesome it's up. I believe madammina from the Kairi group wanted to join. Here's a screen cap of our ladies. Great pic, to bad I can't tell the diference between Jaap or Final Mix. I definitely want to join! That was one of the cutest scenes in BBS! Also, I'm really hoping that Kairi will get trained by Aqua to be a Keyblade wielder in the future. Given that Kairi's so spunky and impulsive, while Aqua's more reserved and mature, it'd be fun to see them fighting side-by-side! Welcome Organization_42! You'll be added soon! Thanks guys. This should be fun. Welcome 8298906! you'll be added. Joining~ These two make an adorable sisterly pair. Welcome loke13 You'll be added soon. May I join? 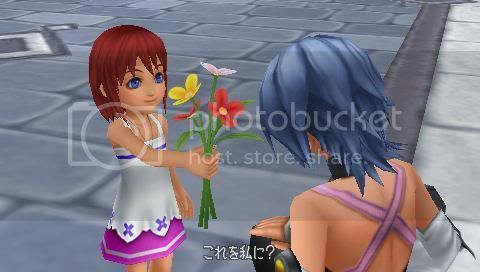 I really like the way Aqua and Kairi seemed so sisterly in Birth by Sleep and hope to see their friendship develop when they meet again. Yay, this club is already getting a lot of members. I definitely can't wait to see a reunion scene between Kairi and Aqua. If kairi and aqua were to meet again I wouldn't really call it a reunion because the girls may not really remember each other. So it would be like meeting foe the second first time.